Can you believe it, I finally got something to post here in our Little House Neighborhood. I wish I had more progress here but I ended up doing a bit of frogging, and my border was off a little at first but I got this much done today. 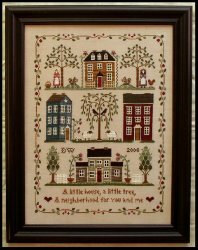 I am stitching this on 40 ct. Lt. Exemplar linen with one thread over two. I had wanted to do this on 32 ct. but they didn't have any in this color at my LNS and I had this and decided to use it. I originally was going to use more Crescent threads but I remember how easy on a larger project it is to maybe get something on it and I had a problem with the Crescent thread bleeding when I pressed with a damp cloth, so I have decided to go ahead with the DMC threads. I did use Old Oak Tree on the border though before I decided this but I like it and am trying to be really careful. Now on to the tree tomorrow! I'm sorry you had to frog! 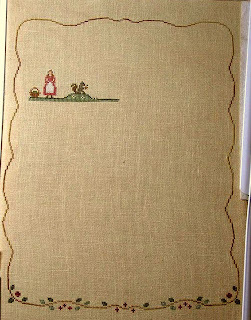 You've made great progress so far - you're braver than I am; I couldn't even attempt to stitch it on 40ct linen!